Softengine, Luritus Choir & Alvar Aalto. In concert. Many of you outside of Europe may not fully understand the Eurovision Song Contest, not everyone inside Europe takes it that seriously, and the recent balkanisation of European counties has led to countries ‘voting for their neighbours hasn’t helped that, but the viewing figures are huge and many a star has been born at Eurovision. In 2014, Finland was represented by Softengine, a rock band consisting of five young guys from Seinäjoki and their debut tune Something Better. They managed an impressive 11th place and, in the process, amassed Finland’s second best-ever score of 72 points (heavy metal monsters Lordi actually won the competition in 2006 with 292 points) Following this performance, Softengine’s profile in Finland has risen pretty high and late last year they released their debut album, We Created the World; Caleb Followill’s roaring vocals, the melodies of Coldplay and fashionable, rave-synths are pretty good signposts to the album’s sound. There was a story in Ilkka, the regional, daily newspaper, on Sunday 11.1.2015 about a slightly different gig for Softengine, one that covers a few local touchstones; rock music, choir-singing and Alvar Aalto! On 15th March 2015, Softengine will be playing a concert in Seinäjoki at the iconic Lakeuden Risti church, which was designed by the iconic Alvar Aalto. At this show, the band will be backed by a local youth choir, Luritus, with whom Softengine have a longstanding connection. Luritus is not a traditional, church choir, they describe themselves on Facebook as a choir for ‘…both boys and girls – children and teenagers. Luritus isn’t a traditional choir. Besides singing, the performances include varied instruments, body percussion, drama, poetry and dance.’ The YouTube video below gives a good idea of what that invloves. 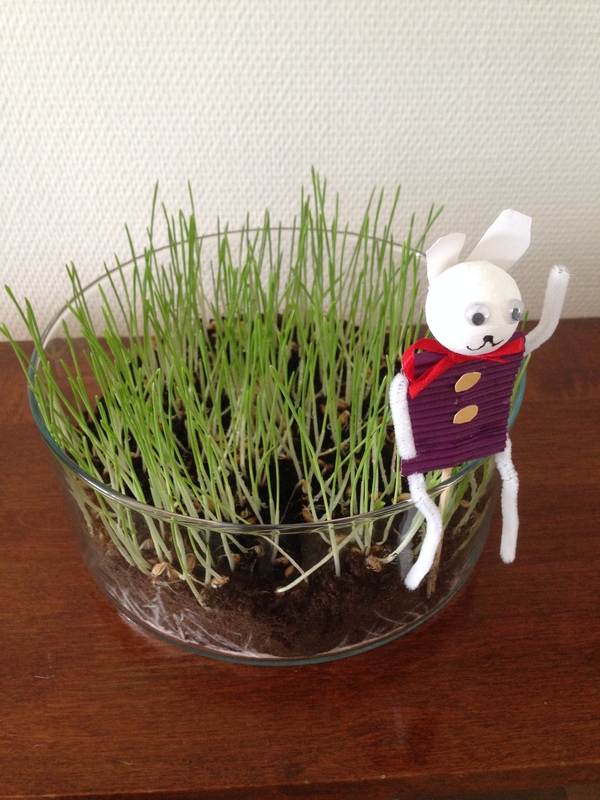 Full disclosure, my son Olli is a member of Luritus, and the Choir Leader, Hanne Orrenmaa, really has them well-drilled both with their singing and their movement. Every performance is different and well worth your time. I have my ticket, and I’m already counting the days. See you there? Seinäjoen Jalkapallokerho (SJK) have a had a busy week, that culminated with the (now traditional) match between the first team and the supporters club (Klopit), who hold the honourary position of 12th man at SJK. This kind of activity only helps to cement the strong bond between the club and the supporters, so a big thank you from the Klopit to everyone at SJK. In other news, earlier this week SJK announced a partnership agreement with FC Jazz from Pori, which will involve structured loaning of players between the clubs from the youth development through to first team squads. 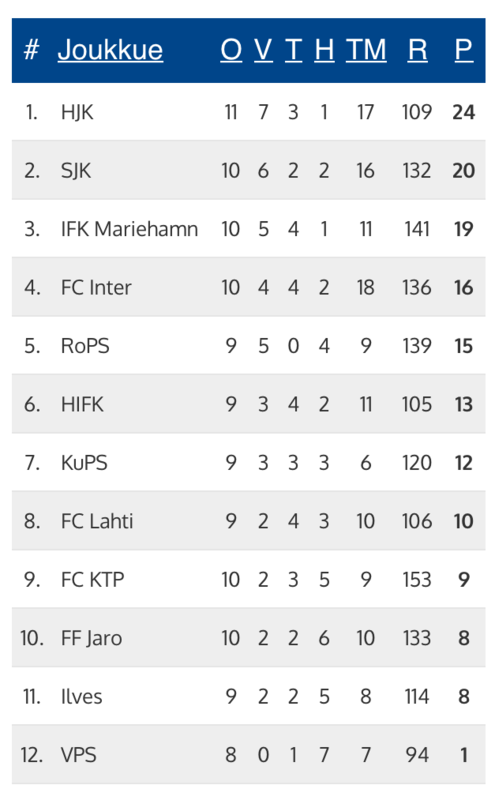 This will give players at both clubs the opportunity to progress and find their level as SJK are in the Veikkausliiga (Premier), FC Jazz are in Ykkonen (1st Division) and SJK ’07, the reserve team, play in Kakkonen )2nd Division.) This will support SJK’s future policy to develop more Finnish players. It was also announced that Johnny Laaksonen, SJK’s midfield playmaker has been selected to join the Finnish National sqaud that is travelling to the UAE next week to play Sweden in Abu Dhabi and Sudan in Dubai. 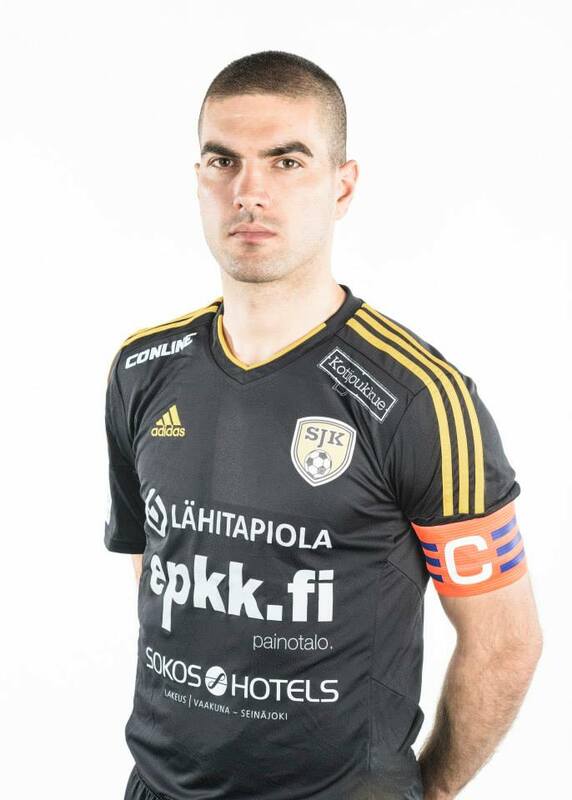 This is a well deserved reward for Johnny who was voted the Players Player of the Year in the Veikkauliiga 2014. 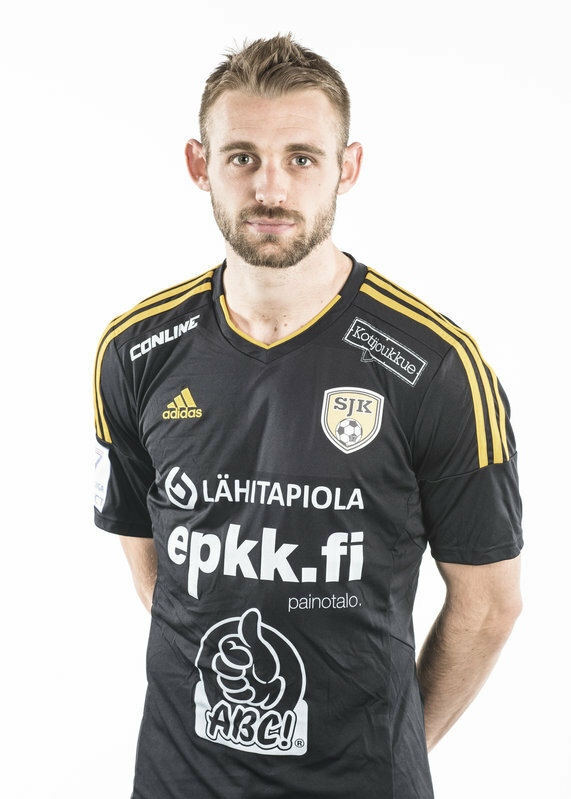 SJK have also been busy in the transfer market signing Jussi Vasara​, attacking midfielder and former captain at FC Honka​​ in the Veikkausliiga, Cameroonian ​goalscorer ​Ariel “Tuco” Ngueukam​ and​, announced today that, subject to a couple of contractual matters, Mehmet Hetemaj who is returining to Finland after ​several years playing in ​the ​Ital​ian lower leagues for ​AlbinoLeffe, ​Reggina​ & Monza, he is a tough-tackling, ​defensive ​midfielder who ​has play​ed for the Finnish National team and should fit in nicely alongside Laaksonen ​at SJK. The club has promised there will be additional, strong signings later in January, and based on the​i​r actions so far this winter, who would doubt them. SJK aims to offer a real challenge to HJK Helsinki in 2015 and give a decent account of themselves in their first Europa League campaign, in which SJK will play their home games in Helsinki, at HJK’s Sonera Stadium – a return trip of 710km, 8 hours, from Keskuskenttä, SJK’s home ground! 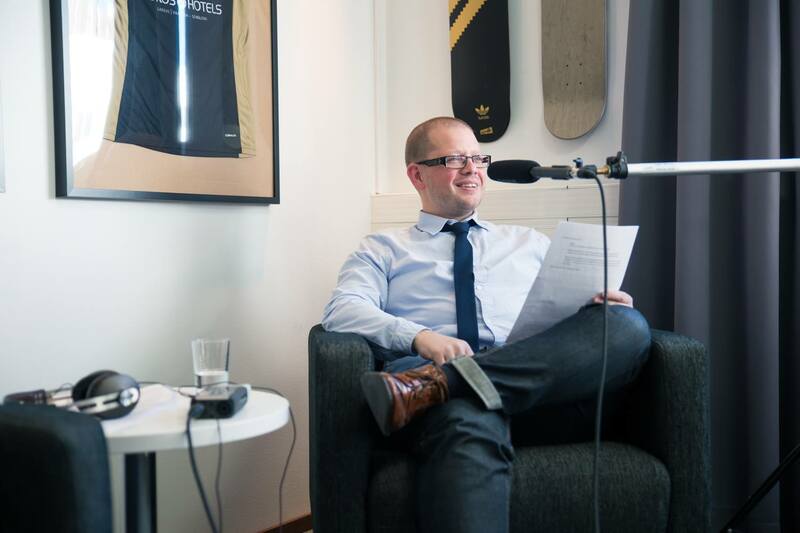 If you want to learn more about SJK, listen to my podcast episode 3 where Lari tells me about the history of the club and Finnish football culture. We all take time to decide who to follow, now you can take control over what you actually see! I’ve recently learned a little more about Google+, which allows you to prioritise what you see and notifies you when new content is available. The following steps are not difficult or time-consuming, but not everyone knows how Google+ works, even those that already have a G+ profile! 1. 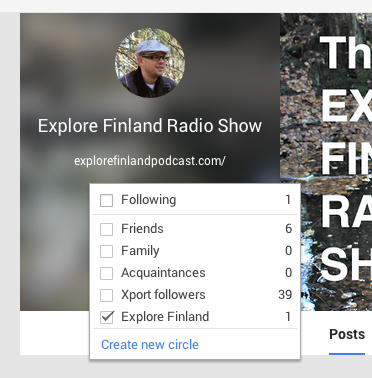 Click here to find Explore Finland Radio Show on Google+. 3. Click on the drop-down menu on the left hand side. Select ‘Home’ this will take you to your home page or ‘stream’. Select ‘Home’ from the drop-down menu. 4. On the options bar (of your Home stream) click on ‘More’ then click ‘Explore Finland’ this will show you the content posted by anyone in this circle. Tip – if you find the G+ stream looks confusing, you can also change the layout of your stream here. 5. 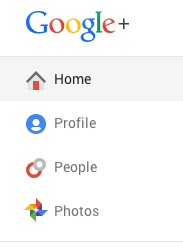 Above any posts, there is a box called ‘In this Circle’ where you will find a grey bell icon. Click on this so it becomes red. That’s it! 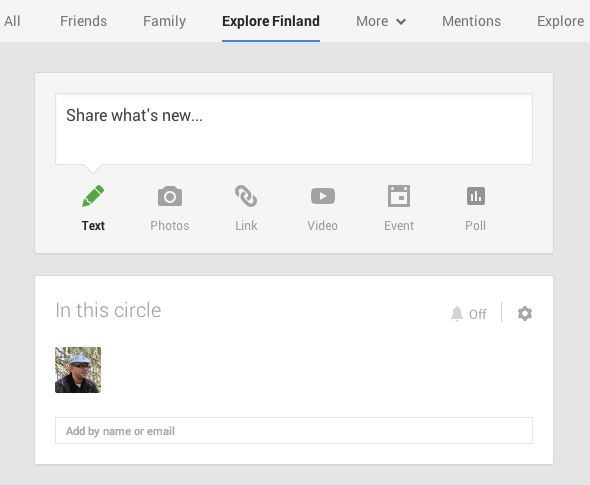 You will now receive notifications when Explore Finland posts new content on Google+. Let me know how you get on by adding me to a Circle and keeping up-to-date on Google+. Although I risk ‘crossing the streams’ with this post – brining my day job into the Explore Finland world – this article is about an event in Finland, so it’s not completely off-topic. 2014 was my first time at the Slush event. I’d been to several trade shows in the past and this couldn’t be so different, could it? 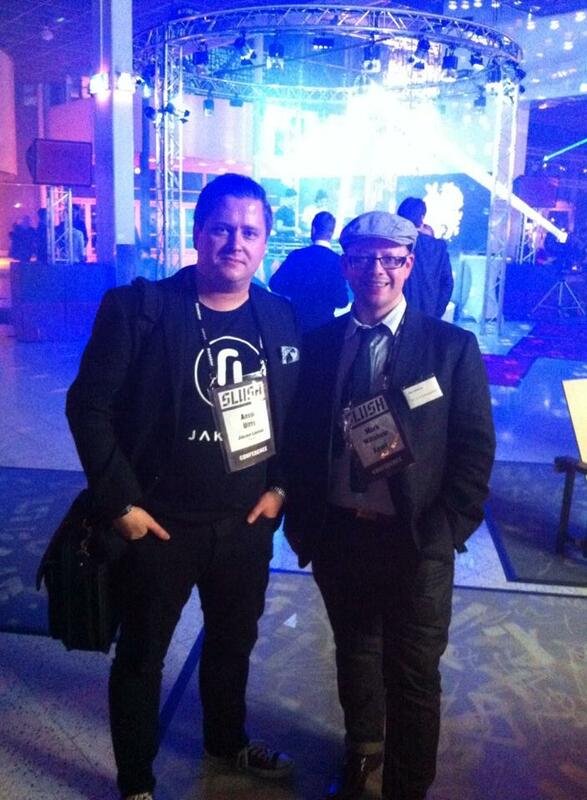 Below are a few observations and lessons-learned at Slush 2014. Even if you only want a brief catch-up meeting or conversation. There were over 10,000 tickets sold, the chances of bumping into the right person are small, and the chance of them having time to see you at the last minute, smaller still. I tried for two days to meet with a friend, we both wanted to, we tried, but it just didn’t happen. 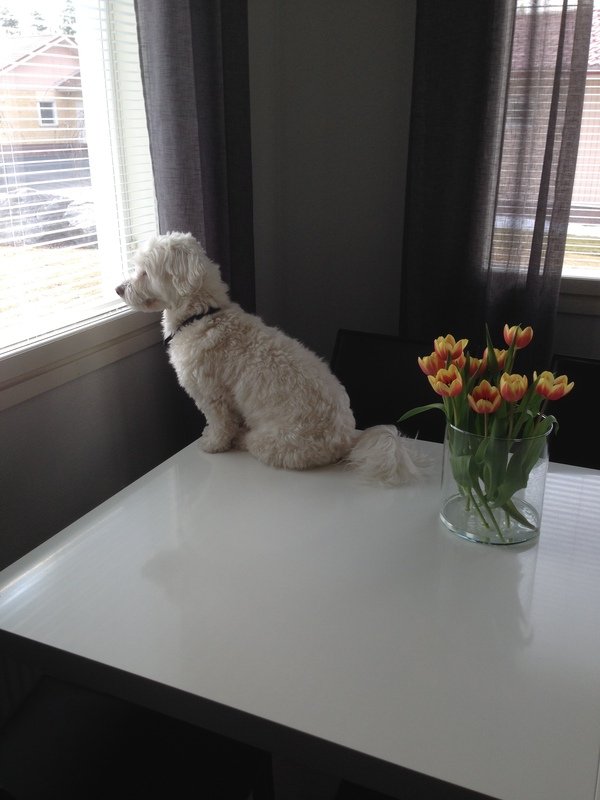 I’m sure we’ll get-together someday soon Berit! Slush is a dark, noisy event. a brilliant atmosphere but maybe not the place to discuss the minutiae of your business, so probably not the place to seal a deal. Use it as an opportunity to initiate a new business relationship, or to nurture an existing one. Be clear about the amount you want to raise and how you will use it. Contrary advice and contrary examples were in effect at Slush. One investor said he wanted to know what the money would be used for, someone else said they’d been advised ‘Ask for help and you will get money, ask for money and you will get advice.’ Many of the early Slush100 pitches didn’t mention how much they wanted raise, some of those in the later rounds did. There is less structure to the booths than a traditional show. 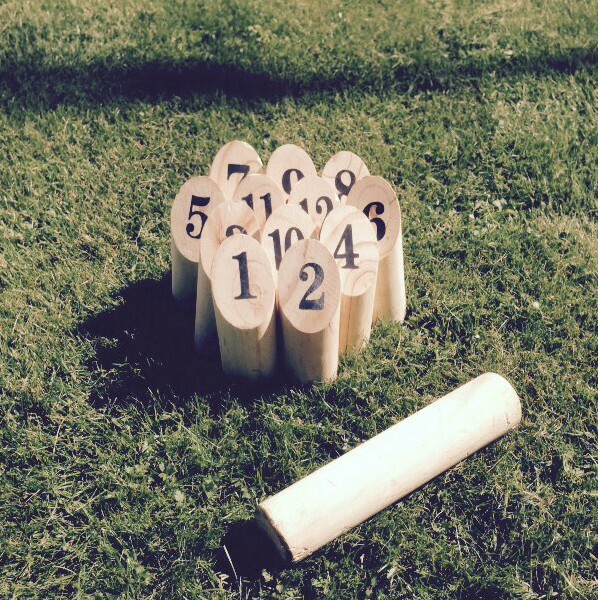 As befits an event that attracts a great number of start-ups, they were mostly simple roll-up signs and a table. There are a few different ‘exhibition areas’ where the booths are located, and they are positioned side-by-side, close together. This created a real buzz around these areas, but it’s not always easy to get close to the booth although it does ensure no-one hides behind a table – there is nowhere TO hide! The idea of using #hashtags to promote your live event (see my previous article) was in full effect at Slush. We were encouraged to use the hashtag #slush14 before the event started and there were signs all over Messukeskus reminding you. If you search #slush14 on Facebook, Twitter, Google+ you’ll find that it was well-used. Slush is unlike any event you’ve ever been to, darkly lit, dry ice and energy drinks – and that’s during the day. At night they simply replace the speakers with live music! Oh yeah, and the evening party included beer for the duration of the night. Many thanks to the organisers at http://www.slush.org/ see you next year. The family were all awake by 9:00 and had a quick breakfast. It was a chilly minus 12 degrees outside when we took Boris the Dog out for a walk in the nearby woods, while the sauna was warming-up for our return. The Xmas Eve sauna is not compulsory but many families do it and I wasn’t going to miss out. I couldn’t convince everyone to get involved but Evie joined me. Leena was also preparing the first of the traditional meals of the day; Riisipuuro (rice porridge, or rice pudding) is a traditional way to start Xmas, with an almond or two dropped in to bestow good luck on the person who finds it in their bowl (similar to the British tradition of sixpence in the Xmas pudding). We ate this at midday rather than for breakfast, and I was lucky enough to get two almonds in my bowl – the kids complained bitterly, then declined to eat those found in their bowls! After eating and getting dressed we set off on the trip to Mummilla (Grandma’s home). Xmas dinner is something of a feast in many countries and Finland is no different. What IS different is the food that is served. The most ‘Finnish’ part of the menu are the various ‘laatikko’ dishes – literally ‘box’ dishes, these consist of various mashed or pureed vegetables baked in trays in the oven – we had carrot, potato and swede, along with a liver & rice combination, all of which are quite sweet and very more-ish! The main meat served is a roasted ham, plus boiled potatoes, green salad, pickled herrings, coleslaw, and a seasonal, spiced bread ‘Joululimppu’. Dessert was served two hours later allowing everyone to make a little room for various cakes, biscuits and chocolates as well as the mince pies and Xmas pudding from the UK. In the meantime, we all took a short walk to the nearby cemetery for the tradition of lighting candles in honour of our ancestors. The sight is quite something to behold, with hundreds, thousands(?) 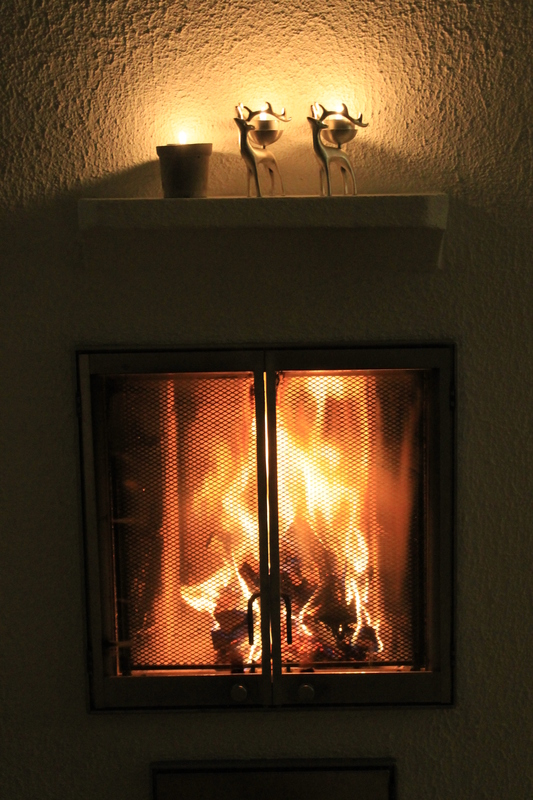 of lit candles, the photos really don’t do them justice! It allows you a time-out from all the feasting to think a little about previous generations, and maybe what they would have thought about the concept of a blog or a podcast. 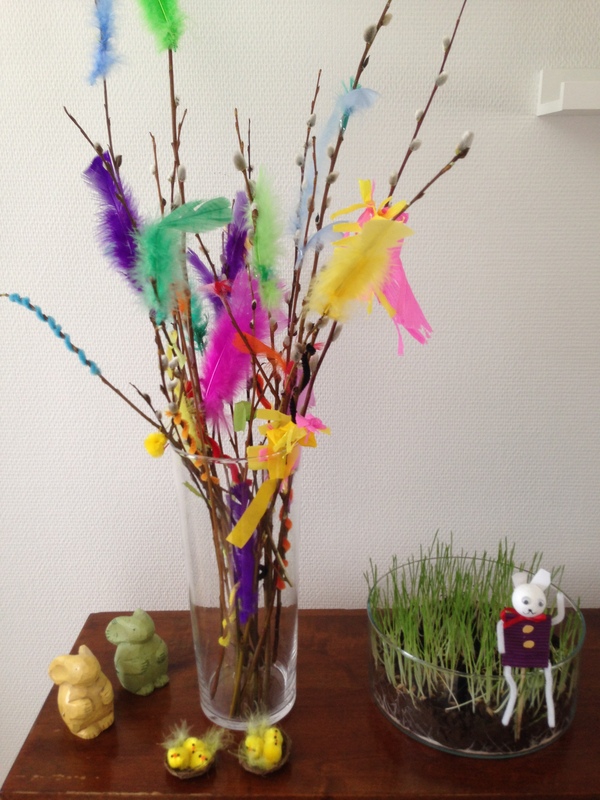 When we returned home the kids found out that ‘Joulupukki’ (Santa Claus) had been. Evie wasted no time putting her ‘tonttu’ hat on, a red elf-hat with a bell on the end, and attacking the pile under the tree. Many Finnish families arrange for someone to visit dressed as ‘pukki to give out the presents, with the children singing songs for ‘pukki. This could be a family friend or someone raising money for their sports club (you can see the photo from our Xmas in 2013) – that said the younger children often find this a little scary and Leena has bad childhood memories of Santa being a little too merry at the end of a long day delivering gifts! We didn’t have anyone come this year, but that didn’t dampen the excitement – those presents didn’t stand a chance! Well, maybe not ‘magic’ mushrooms, but the way these sprang up almost overnight was quite something to see. There’s a small trail through the woods near our house, a loop of about 400 metres – perfect for early morning walks with Boris. One morning in late-August, we entered the woods and I was struck by the sheer variety of mushrooms that had appeared. These were snapped on my phone, as I don’t often take the SLR out with me for the morning walk! I have absolutely no idea what they are, or which might be edible, but I intend to cover that on one of my podcast episodes, so watch this space. In the meantime, if you know what any of these mushrooms are called, why not let everyone know in the comments? Located just south of Etelä-Pohjanmaa, Helvetinjärvi couldn’t be named less appropriately. It’s name translates as Hell’s Lake and comes from an old story containing a warlock, an argument and cursed fish supplies, naturally! We came to visit on a Saturday in late-September and brought the kids’ cousin Siiri along for a walk through the woods to the lake and the gorge. Boris was able to come with us, so long as we kept him on a (flexi-) leash. We parked near the Helvetin portti restaurant at Kankimäki, had a quick picnic in the car and then headed off to follow the 4km track. It was immediately clear that the terrain here was different to Seinäjoki. On the first part, the gravel trail wound through a wooded area, where the moss covering the rocks was so thick that the kids bounced on it like a trampoline, and the narrowest stream I’ve ever seen – you could hear the babbling, with no sight of the brook. After a consistent incline, we came to a significant structure of wooden walkways and steps, the former taking us safely across the rocky cliff top with lovely views of the lake, to Helvetinkolu, a natural gorge in the rock that leads down to the lakeside. The stairs taking a slightly easier route down to the same area, with a toilet and wood-hut and not much else. Perfect, it seemed, for the group of Scouts to cook their lunch over open-fires. We we soon on the home straight, heading towards the car, the restaurant, hot coffee and ice cream – rewards for everyone! There’s an interesting law in Finland called Everyman’s Rights, which basically allows anyone to pick any flowers, berries, mushrooms etc. that are growing in the wild. You even have free access to angling and ice-fishing in many places. Unlike back in the UK, you have rights even if you’re not the landowner and if you’re just in Finland to visit. I hope you like jamming too!